Last week we couldn´t find a single new investigator. It was really frustrating. Something needed to change. I did divisions with Elder Soriano and he showed me some different things to find new investigators, that I need to be more insistent but with The Spirit. That I need to have the attitude that I am going to enter that house and teach that family yes or yes. It really helped. I also figured that I wasn´t praying as earnestly as I should have. That I really wasn´t the most sincere in my prayers with our father in Heaven. I really think that made all the difference this week. We found 20 this week. I really think the Lord has blessed us so much this week. I am learning a lot about myself really in this mission. 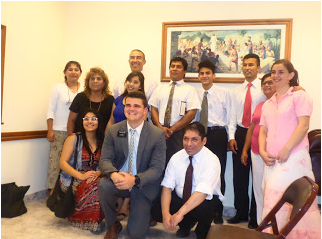 Elder Villanueva and I are teaching and contacting more in unity and it´s really made a big difference. It´s amazing the people that found us. The people that found us before we found them. Really grows my testimony that our father in heaven really wants to help us and but want´s us to give a little more.